Apps built using iBuildApp can get a lot of downloads and get it quickly in the matter of days. Today, we would like to showcase an app created by Eric from Argentina who has his member profile at our community http://ibuildapp.com/members/42154 . Description: Attention All Tennis Addicts (myself included), this app is for YOU! 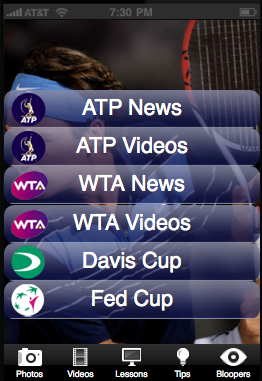 Here's what you get: ATP News, ATP Videos, WTA News, WTA Videos, all about the Davis Cup and Fed Cup, Photos, Video Lessons, tips, and more... All the material is constantly updating, so you won´t miss a thing of what´s going on, or you´ll be able to learn a new drop-shot technique, even if you are at a boring meeting ;) HERE's what to do next: Grab YOUR FREE copy of the Tennis app TODAY! . The App can be found in iBuildApp App Store and played in the browser at this link: http://ibuildapp.com/projects.php?action=info&projectid=79595 . There’s a lot of of opportunities with mobile apps built using iBuildApp. With pictures, Videos, Picture Taking, Coupons, GPS functionality and eCommerce—all of which are available on iBuildApp—engaging your customers via mobile is becoming much easier now. . Here are screenshots of the app: .